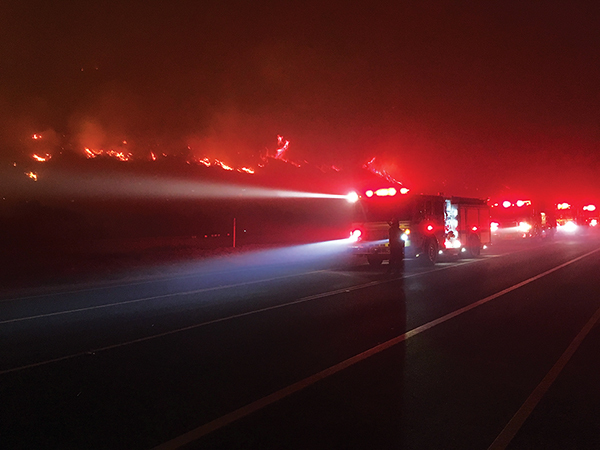 For three weeks in December, when residents of Ventura and Santa Barbara counties needed to know where the fire was, they tuned to KCLU-FM. The station’s news director, Lance Orozco, was on the disaster’s front lines, reporting stories of heartbreaking loss, narrow escapes, brave rescues and outpourings of aid for victims. Orozco already had left the station on the evening of Dec. 4 when he received a tip from evening anchor Dave Meyer that a fire erupted near Thomas Aquinas College, north of Santa Paula. Orozco has covered other monster fires for KCLU Radio and won a national award for his 2016 reporting on the Sherpa blaze near Santa Barbara. He knew that when tinder-dry brush meets roaring wind, trouble follows. 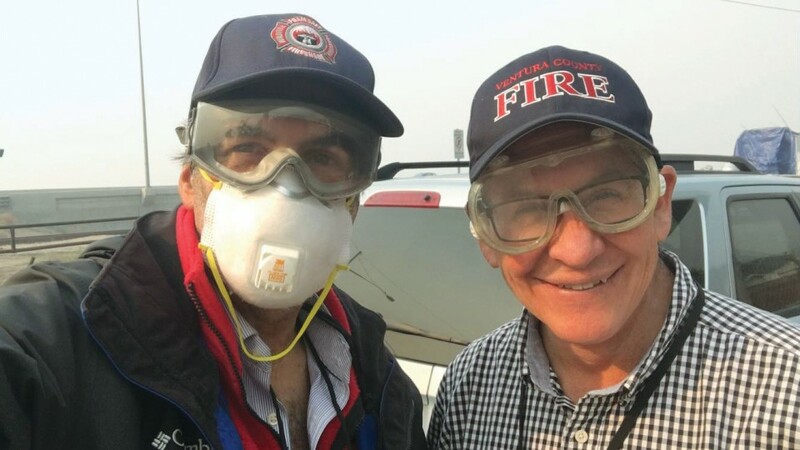 By 3 a.m. the 35-year news veteran was reporting live via his tricked-out laptop from Ventura, where hillside homes were ablaze. Power was out in much of the city. Evacuees would later tell him they sat in their cars using his coverage to follow the fire’s path. “My job was to be there for the listeners, to be their eyes on the fire,” he said. Orozco stayed on the air until 1 p.m. that day, grabbed a couple hours of sleep and broadcast until 11 p.m. the next day. When he was told he looked tired, he replied he’d slept eight hours – in three days. International and national news outlets came to Orozco to inform their listeners about the Thomas Fire as it entered the record books as the largest wildfire in modern California history. He reported for the BBC, National Public Radio and NPR affiliates in Los Angeles, San Francisco and Phoenix. KCLU listeners came first, though. He even provided them with some personalized reports. A Montecito resident emailed Orozco to ask if his home was still standing. The newsman happened to be in the area and replied with the encouraging report that a firetruck was parked in the man’s driveway. “Obviously I couldn’t tell everyone about every house in every neighborhood. But I know nothing is worse than to not have information and to be in limbo land,” said the 59-year-old who has worked at KCLU for 16 years. Few stories in recent memory have touched more lives in the region than Thomas, which scorched 280,000 acres from Fillmore to the sea, incinerating hundreds of homes in neighborhoods few people imagined would ever burn. The blaze took the lives of a firefighter and a resident as she tried to flee. By consuming hillside vegetation, the blaze set the stage for January mudslides that ravaged Montecito, killing at least 21 and destroying hundreds of structures. For days, mud and debris blocked Highway 101, the state’s vital transportation artery. Around Christmas, with the blaze mostly contained, Orozco took badly needed down time. But it wasn’t long before disaster loomed again. With forecasters predicting dangerous downpours on the burnt hillsides, KCLU kept listeners informed on evacuations. When the deluge finally hit on Jan. 9, Orozco found his path into Montecito blocked by a mountain of mud and boulders as big as cars. It took him a day to navigate into the disaster zone, where he stood knee-deep in mud surrounded by homes so damaged, parts of them somehow ended up in the tree branches. During his breaking-news coverage of the twin disasters, Orozco put 7,000 miles on the station’s SUV, which was at one point accidentally drenched by an aerial water drop. He also came under flame-retardant liquid that ruined his shirt. He witnessed folks fighting ember showers with garden hoses to save their neighborhoods.